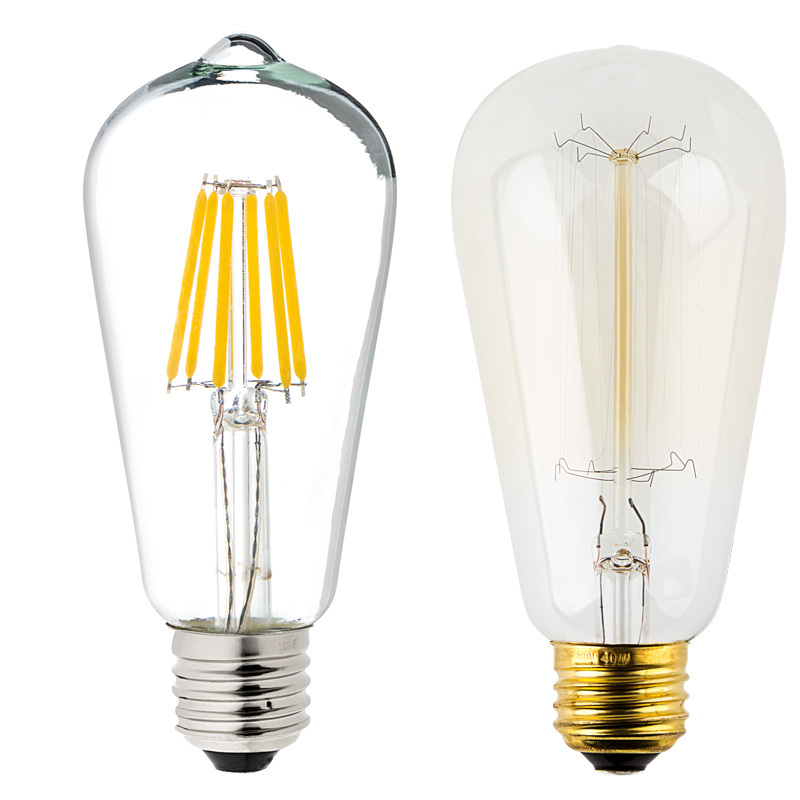 LED Vintage Light Bulb - ST18 LED Bulb w/ Filament LED - 5W: On Showing Beam Pattern And Comparison Between Warm White (Left) and Ultra Warm White (Right) At Full Brightness. LED Vintage Light Bulb - ST18 LED Bulb w/ Filament LED - 5W: 360° View. 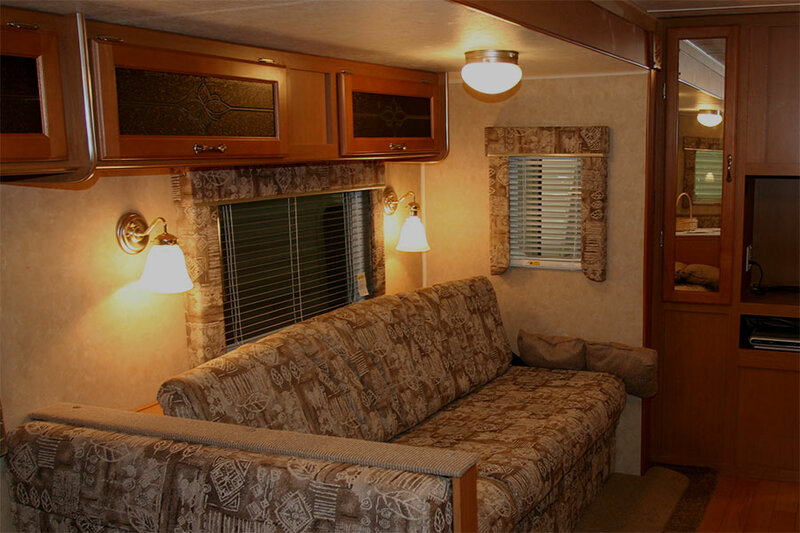 LED Vintage Light Bulb - ST18 LED Bulb w/ Filament LED - 5W: Shown Installed In RV In Ceiling Fixture Over Table In Natural White. 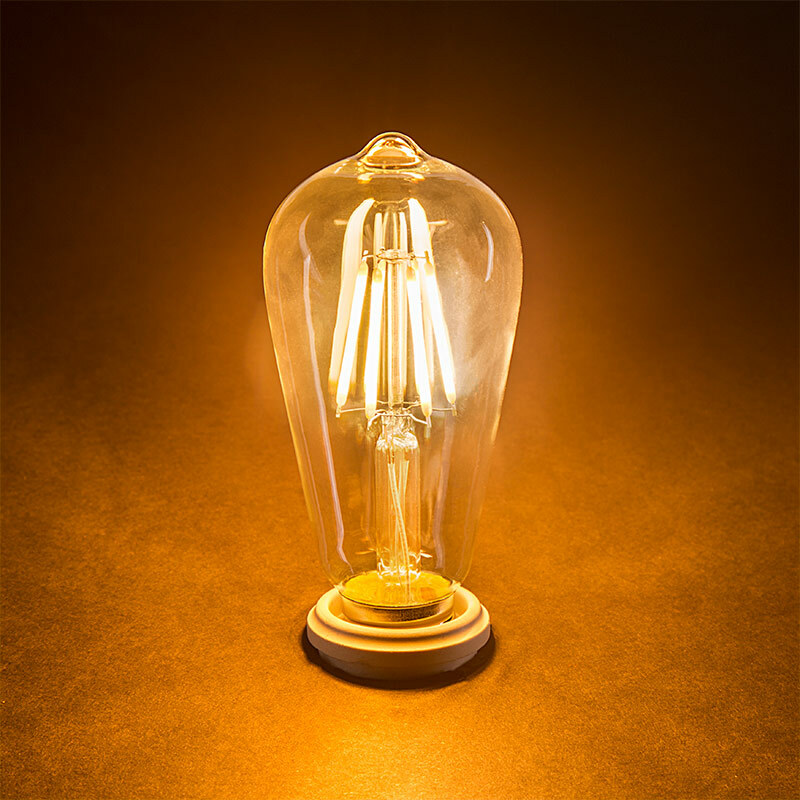 LED Vintage Light Bulb - ST18 LED Bulb w/ Filament LED - 5W: Shown Installed In Overhead Light Fixture In Warm White. LED Vintage Light Bulb - ST18 LED Bulb w/ Filament LED - 5W: Shown Installed In Overhead Ceiling Fixture And Wall Sconce In Warm White. 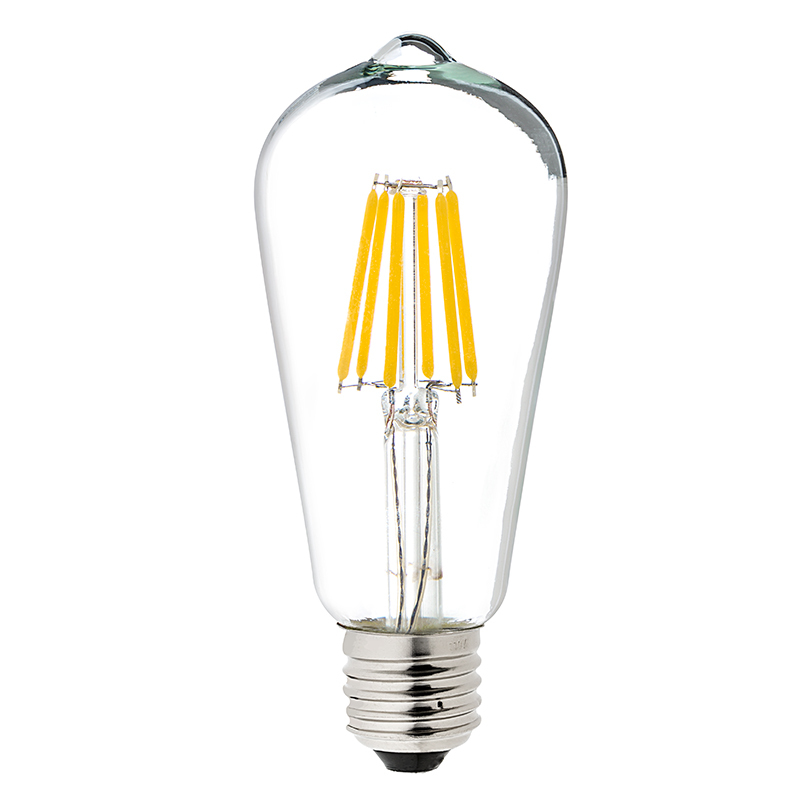 This off-grid/RV LED filament bulb is perfect for ornamental lights, decorative light strands, RV interior lighting, boat cabin lighting, or for any decorative 12-volt application that accepts ST18 teardrop bulb types with E26/E27 bases. The bulb's low current draw also makes it ideal for off-grid living and renewable energy applications such as hydro and solar powered lights. 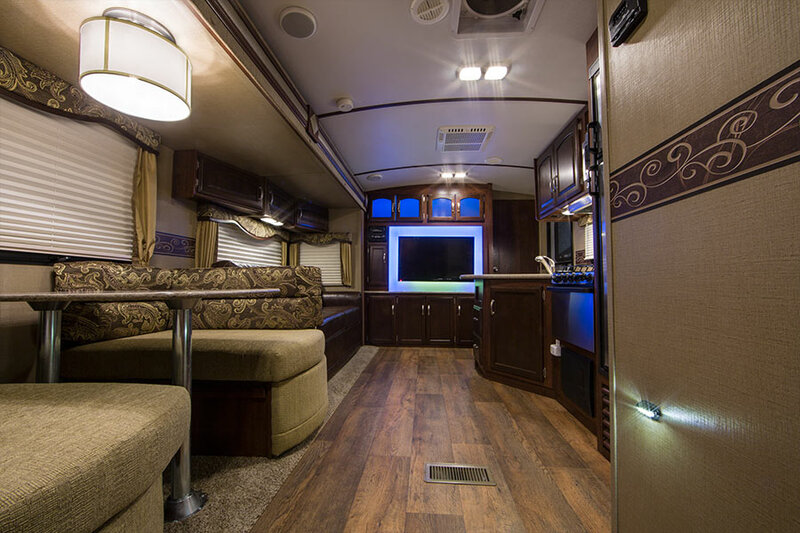 Using 6 linear COB (chips-on-board) LEDs, the ST18 bulb emits up to 350 lumens of ultra warm white illumination. The LED light consumes just 5 watts of power; an incandescent bulb with comparable light output would consume 40 watts. 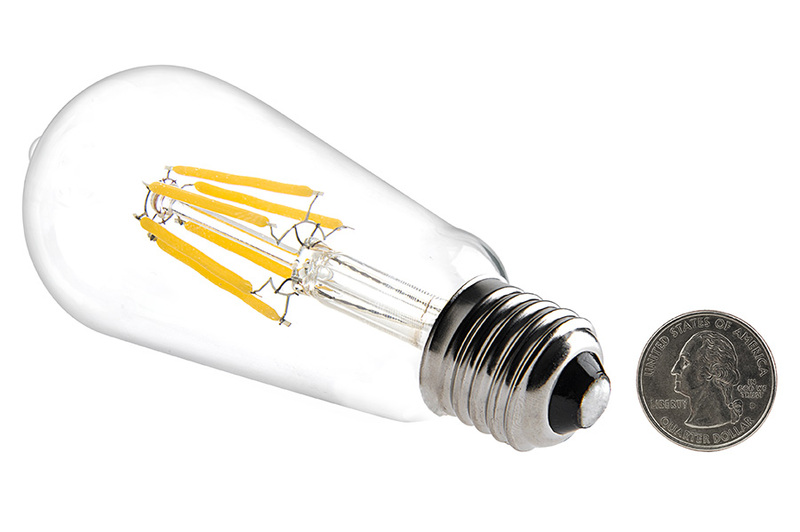 This bulb operates within an 8-16V AC/DC range and is designed to last 25 times longer than incandescent bulbs. Price per bulb. The application is to use this bulb on an outdoor fixture mounted on a pilaster. It is part of a 12v landscape lighting system. 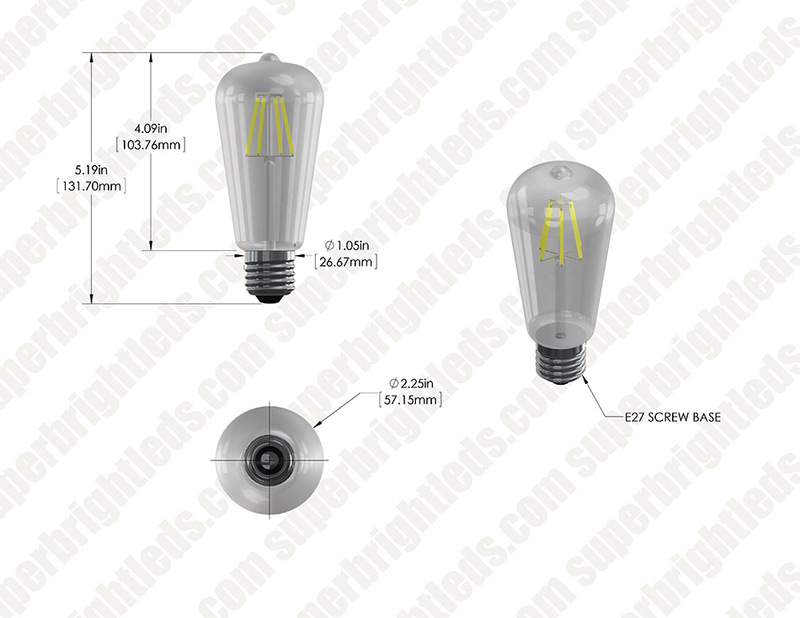 The bulb is very attractive even when off as it is enclosed in a clear beveled glass enclosure. When lit, it casts a nice warm glow. I was initially concerned with the level of brightness as my ideal bulb was only to be 25W's but with the warm light this bulb casts when lit, the amount of light for a 35W bulb is just fine. Very happy to find this bulb. As this was my first purchase from Super Bright LED's and couldn't be happy with the order and fulfillment process. When local inspectors raised hell about my vintage wiring and lighting, I re-engineered the system to 12v with minimal trouble. These bulbs have been operating nightly for over 3 years, and if I had not broken one while being careless with a ladder, I would not have needed to order more ! They look good in my 1910 vintage streetlights and give a soft, warm glow, period correct for the antique fixtures. These ARE dimmable! Beautiful,accurate warm-glow! 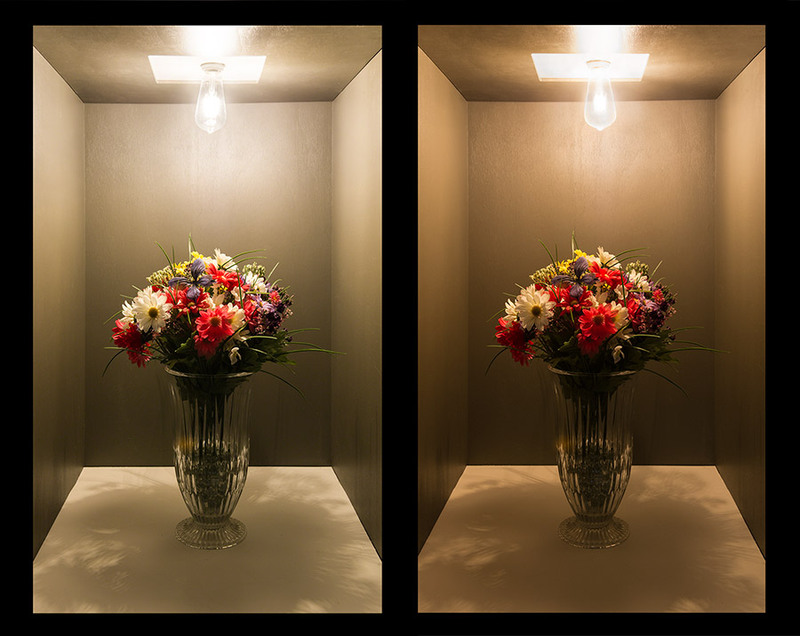 2200K is the a tough color temperature to find in LED bulbs, but it's the color that you get when you dim an incandescent bulb, and consequently it's the color temperature you would most attribute to warm and inviting environments. The more common warm white temperature is 2700K and even more common is 3000K. I was impressed that I could find a standard filament-style LED bulb in 12v, much less 2200K! They are a little pricey, but so worthwhile when energy savings is a priority- when you are operating off the grid. They are perfectly bright, but with a wonderful warm glow, that isn't harsh in the least bit. The best surprise is that, in spite of their rating as NOT dimmable, they in fact ARE. You need to use a 12v dimmer, but they are inexpensive and provide a flawless dimming experience, better than any 110v dimmer. I hope the availability of these bulbs stick around. i bought 2, then 2 more and now one more to replace all the 12 volt lamps in my rv. 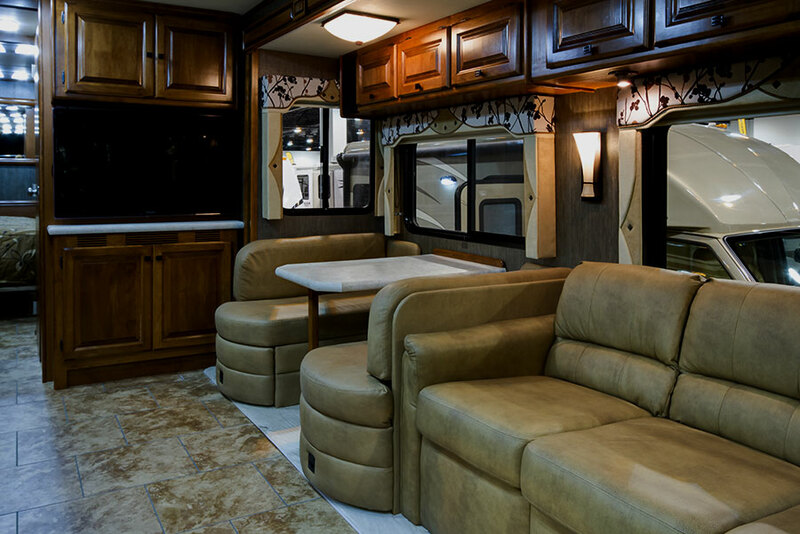 the color is soft and warm, yet provides very usable light with next to no power consumption. im impressed!